After starting his retail career at John Lewis Darran soon adapted his retail philosophy to the garden centre industry. One of the country’s leading Plant Area Managers he is constantly looking for quality plants and suppliers and believes British is best! 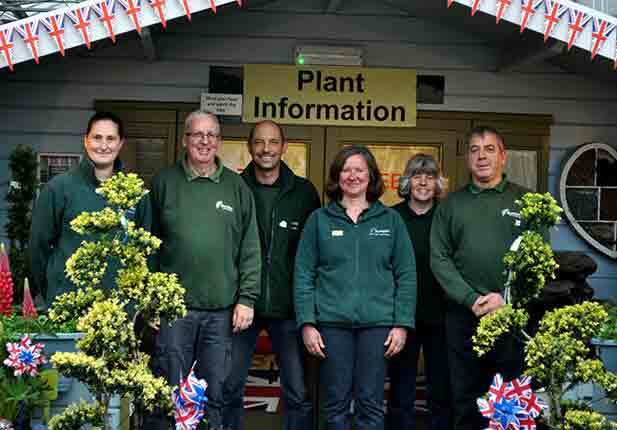 Leading a very customer focused team with great horticultural knowledge they have won many awards over the years for their achievements within the horticultural retail sector. Jo has a varied retail background which has given her the experience to deputise in the absence of Darran. She has a keen eye for detail and helps to ensure the day to day housekeeping of the plants department is maintained to a standard fit for the queen. She can often be found ensuring our inspiration bedding collections are tip top and looking fabulous. Susanne has been an integral part of the Plants Team for many years. She has a keen eye for colour and takes the upmost pride in her Clematis and perennials. Over the years she has worked all areas of the plant area and used to look after our Roses too. Creating displays and inspiration collections are just 2 of her favourite elements of her job. An ex-florist by trade, Lisa has an amazing gift of making things work together in perfect harmony. She is the creative force behind our in house production of hanging baskets and patio containers and is one of life’s ‘loveliest people’. The longest serving member of the plants team Lisa has seen many changes over the years and has always been a key team member when implementing them. Dave’s background is in parks and gardens management so is very much in tune with the importance of presentation. He gets no greater satisfaction than walking round with customers and resolving their problems, ensuring the highest level of customer service. A true dog lover, he’ll quite often be found fussing a customer’s pooch as we do welcome well behaved dogs here at Burston. Having spent the first few months of her Burston life working in garden care, Helen seized a chance to come and work on the plants team. She has certainly hit the ground running, and as she spends some of her spare time gardening for friends and family she has great product knowledge for not just plants but all the accessories needed in the garden too. Lesley is our newest member of the team. A former life in IT, Lesley missed the open air and working with people. Currently retraining in horticulture Lesley has fitted into the team like she has been here for several years. Customer focused at all times, Lesley will be delighted to help you with your gardening needs.